At Aspen Air Conditioning We Care! Our mission is to provide our customers with the highest level of comfort through quality maintenance, service, and installation practices. Since our beginning in 1983, Aspen Air Conditioning has been focused on the comfort needs of Southeast Florida residents at home and at work. We pride ourselves in achieving the highest customer satisfaction through our TEAM of experts which include our installation, service and inside support. Aspen Air Conditioning is a proud preferred installer for The Home Depot. We have earned and maintained an A+ rating with the Better Business Bureau and are active members of the Boca Raton Chamber of Commerce. Aspen was presented this year with the prestigious Carrier Presidents award. We replace, maintain and service all brands of air conditioning systems. 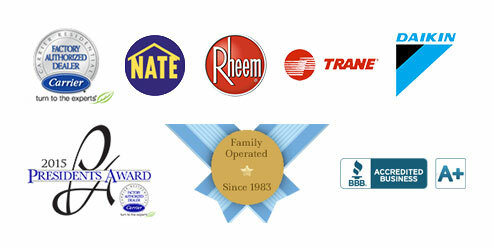 HVAC repair and HVAC Replacement/Installation. Great customer service. Jason the service tech was excellent and took his time explaining what the issue was with my Air conditioner. The issue was fixed and Aspen now has a new customer. Thank you Aspen and Jason. I'm a single mom who had multiples companies come to my house for an estimate on a new AC unit and they wanted to add stuff that I didn't need it. ASPEN in the other hand was AMAZING the professionalism of the salesman Tim was incredible, the technicians very professional and efficient and the best part I got a NEST thermometer and smoke detector. BEST COMPANY EVER!!!!!!!!!!!!! Aspen were installing a new A/C system for me. The team arrived on time. put down the drop clothes to save my floors. I hardly knew they were there. They were extremely efficient, got the job done much quicker than I expected...All three guys were pleasant and friendly...Answered all questions that we had. I would highly recommend this company. He was great and very professional. Knew exactly what was wrong and fixed the problem right away! I would highly recommend him. I am so happy that I have Aspen Air looking out for my best interest. If you're looking for a company that is honest look no further. Chris who has been my service tech goes out of his way to make sure you are happy with the service. My A/C is blowing cold air for that reason alone I'm grateful. Thanks again for responding to my service needs so quickly.